The committee will select a winner for each category. The decisions of the committee are final. The Outstanding Master Thesis Award is accompanied by a prize of € 1200, and the Outstanding Undergraduate Thesis Award by a prize of € 800. The degree must have been awarded between November 15th 2015 and December 31st 2017 (inclusive). Students who obtained the degree at TU Wien are excluded from the nomination. A cover page that contains the name and contact details of the nominated person, the title of the work for which the person is being nominated, award category, date on which the degree was awarded, and name of the university. An English summary of the thesis of maximum 3 pages, excluding references (A4 or letter page size, 11pt font min.). The summary must clearly state the main contribution of the work, its novelty, and its relevance to some of the aforementioned areas of interest. An endorsement letter from a supervisor or another endorsing person. The letter must clearly state the independent and novel contribution of the student, and why the endorser believes the student deserves the award. All documents should be in English, with the exception of the thesis. In case the thesis is in a different language, it must be accompanied by a research report in English of at least 10 pages, which should be sufficient for the committee to evaluate the merit and quality of the submitted work. Nominations should be submitted electronically using the following link here. The nominated student must always be listed as the first and corresponding author in the submission form. 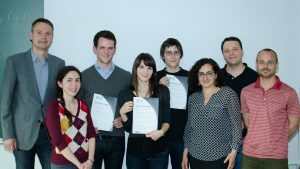 The Vienna Center for Logic and Algorithms announced the first edition of the VCLA International Student Awards in the course of the largest event in the history of logic taking place in Vienna, in the Summer of 2014. The Vienna Summer of Logic (VSL) consisted of twelve large conferences and numerous workshops, attracting over 2000 researchers from all over the world.